Pet Care Dog Kennels HTML Created by kleverthemes. This templates have specific characteristics, namely: Pet has features such as High Resolution: No, Compatible Browsers: IE8, IE9, IE10, IE11, Firefox, Safari, Opera, Chrome, Compatible With: Bootstrap 3.x, Columns: 4+ . 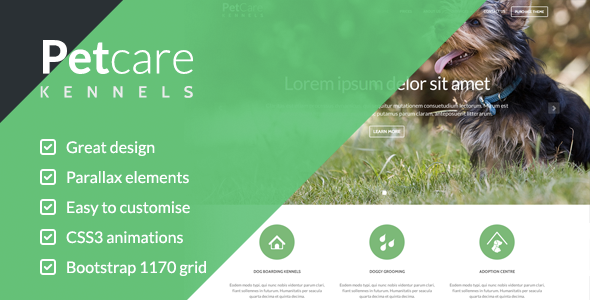 You can use this Pet Care Dog Kennels HTML on Site templates category for animal, animal services, animals, boarding, cats, dog walker, dog walking, dogs, green, kennels, overnight, pet care, pets, vet and another uses. Remember to subscribe to my mailing list for new releases and updates to items!